New Delhi, 12th December 2018. Royal Stag has partnered with the International Cricket Council (ICC) that further strengthens the brand's ties with Cricket, the sport loved by more than one billion adult fans the world over. 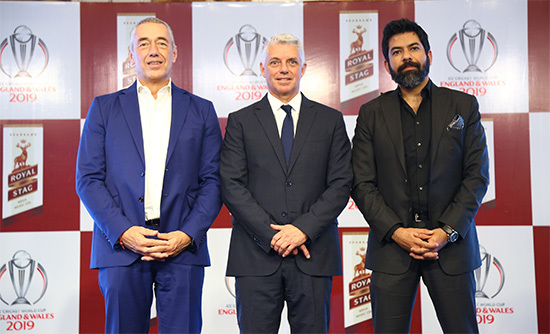 The partnership, which runs through 2023, confirms Royal Stag as official sponsors of cricket's international events, including the upcoming big-ticket calendar events - the ICC Cricket World Cup, ICC T20 World Cup and ICC World Test Championship. Cricket has always been central to Royal Stag's brand communication. Over the years, the brand's continuous association with the world's top cricketers has bolstered its engagement with cricket lovers across the country. "Royal Stag has always stood by its brand philosophy of "Make It Large" - inspiring people to dream large and be the creators of their own destiny. In India cricket transcends from being a sport to a religion, with an ever-increasing set of devoted cricket lovers. Our journey with cricket started in 2000 and since then we have only strengthened our brand associations with the sport, creating a huge impact on cricket fans across the country", says Kartik Mohindra, CMO, Pernod Ricard India. Commenting on the deal, Kartik Mohindra further added, "Our aim is to share the excitement of the game with cricket fans around the world. Partnering with ICC, one of the most coveted sports bodies in the world, allows us to deliver a truly "Make it Large" experience for die-hard cricket fans, especially with the ICC Men's Cricket World Cup around the corner". On this momentous occasion, Guillaume Girard-Reydet, MD, Pernod Ricard India said, "We are delighted to partner with the prestigious International Cricket Council, and look forward to an action-packed calendar in the next five years of which two events in India only. As India gets ready to host two of these upcoming tournaments, this partnership firmly cements our position in the international sports arena. We continue to stay committed to the sport and cherish the spirit of the game." Commenting on the agreement, David Richardson, Chief Executive, International Cricket Council, said: "The ICC is pleased to welcome Royal Stag on board as our Proud Partner. We look forward to working together for the next five years in delivering a meaningful experience to cricket fans across ICC global events." Seagram's Royal Stag is the flagship brand of Pernod Ricard India. Royal Stag has been a consistent star since launch, and a brand quite often credited to have changed the rules of the game. It is for the young, confident, progressive and inspiring individual who embodies self-belief. The brand has been inspiring young India through its communication around the philosophy of "It's your life. Make it large". Pernod Ricard India (P) Ltd. is a fully owned subsidiary of Pernod Ricard SA and is a fast-growing multinational alcohol beverage company delivering quality products to its consumers across the country. With leading brands in each category, Pernod Ricard holds one of the most dynamic and premium portfolios in the industry led by Seagram's whiskies such as Royal Stag, Royal Stag Barrel Select, Blenders Pride, Blenders Pride Reserve Collection, Imperial Blue, 100 Pipers and a wide range of International premium brands that include Chivas Regal, Ballantine's, The Glenlivet, Royal Salute and Jameson Irish whiskey. Some of the eminent brands in white spirits category include ABSOLUT vodka, Jacob's Creek and Campo Viejo wines, Martell cognac, Beefeater and Monkey 47 gin, Kahlúa and Malibu liqueurs, Mumm and Perrier-Jouët champagne. Pernod Ricard India is recognized as an industry leader with various recognitions and achievements that help the company deliver quality products to the consumers. Seagram's whiskies are exported to 26 countries across the world. Pernod Ricard India is a socially responsible organization with a strong belief to strengthen corporate citizen by addressing social, economic and environment sustainability in all key states. The ICC is the global governing body for cricket. Representing 104 members, the ICC governs and administrates the game and is responsible for the staging of major international tournaments including the ICC Men's World Cup and Women's World Cup and the ICC Men's and Women's T20 World Cups as well as all associated qualifying events. The ICC presides over the ICC Code of Conduct, which sets the professional standards of discipline for international cricket, playing conditions, bowling reviews and other ICC regulations. The Laws of the game remain under the auspices of the MCC.